This Dutch baby pancake (aka German pancake) is like a sweet version of popover, mainly made with eggs, milk and flour. It tastes wonderful and goes really well with berries. Wondering how nice the name of this dish sounds to you? To me, I’m totally intrigued to try just by spotting its name. This Dutch baby pancake (aka German pancake) is like a sweet version of popover, mainly made with eggs, milk and flour. The batter is poured into a hot skillet then baked in oven. Not too long, the pancake will puff up around the edges, that’s quite amazing to watch it turning into something looks like an aerated pillow. But no disappointment, when it’s removed from oven, it will deflate quickly. Yet you still have a very soft, smooth texture of a hot crepe that’s full of eggy flavour. You can top it up with any berries and fruits you like. This Dutch baby can be served as snack or breakfast. Use a 20-cm/8-inch skillet, or any oven-friendly tray to melt the butter over medium-low heat. Swirl the melted butter to coat the surface. 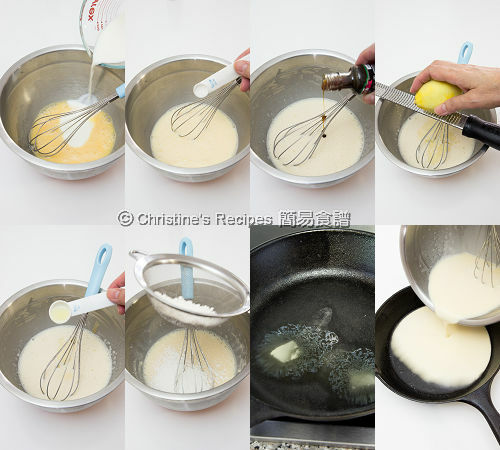 To prepare the batter: Mix the eggs, milk, sugar, salt, vanilla extract, lemon zest and lemon juice. Sift in the flour in three batches and combine all ingredients very well into a smooth batter. Set aside for 15 minutes. 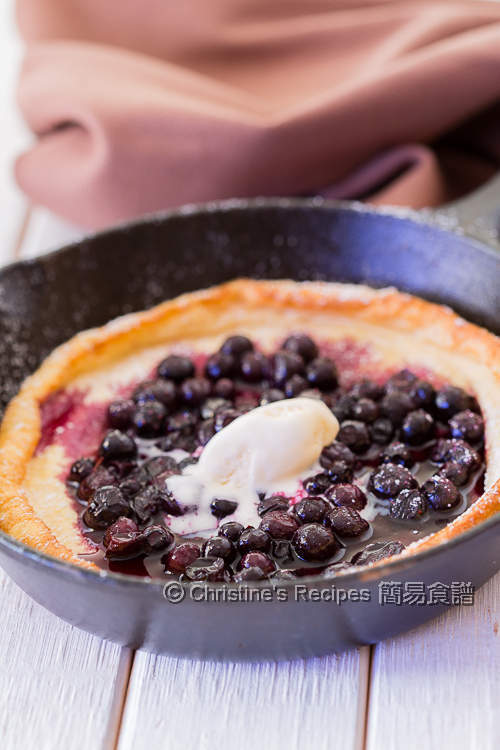 To prepare the sauce: Put the blueberries, sugar and lemon juice into a small saucepan. Cook over medium-low heat until the sugar is completely dissolved and the blueberries start to turn soft, yet still hold their shape. Preheat oven to 220C / 390F. Pour the batter into the skillet. Bake in the preheated oven for about 15 minutes, until the edges puff up and turn golden. 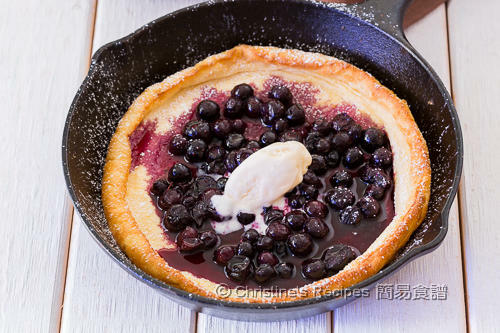 Serve with blueberry sauce, and with vanilla ice-cream if desired. The taste is heavenly tasty. You might like to use any kinds of berries or fruits you like. The blueberry sauce can be made well in advance and stored in fridge. A skillet is traditionally used to make this dish. Any oven-friendly baking dish can be used anyway. A porcelain or ceramic dish is preferable as the heat can be evenly distributed. Fantastic! 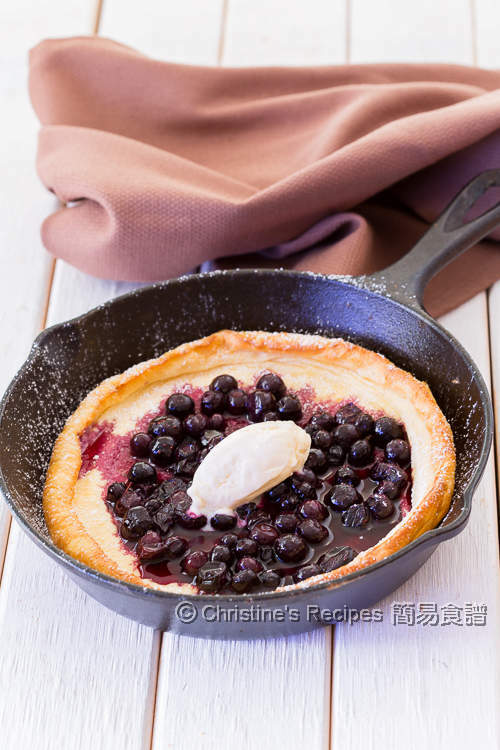 I haven't made Dutch baby in a really long while...and yours with blueberries looks so gorgeous!